Welcome to my nesting blog! This is my place to tell you all a little something of my ideas for my soon to be home! My style, my ideas, my thoughts, my projects, my way! And hopefully it can be a place to find inspiration off my readers too! As an introduction I had better tell you a little something about myself. My name is Kirsty, I love animals and the environment and some of this blog will hopefully represent that! I am very into classic literature and old books... ooo the smell and the knowledge that someone has been here before... this usually does not extend to library books. Not the libraries I visit anyway. They use plastic covers... Plearghk! I love love love coastal style cottages, all things wood (eco-friendly of course!) and white wash! I just lurve all of Sarah's stuff over at www.abeachcottage.com Gorgeous! Check it out. It has served me with much inspiration! And she lives in my neck of the woods! This lamp is one of my most favourite things! My darling man, Andi (check him out over at www.lookwhatgodjustdidtous.blogspot.com) gave me! I had wanted one for ages! All stained glass with pretty dragonflies! Just like off Gilmore Girls... oh yeah I loove me some Gilmore! 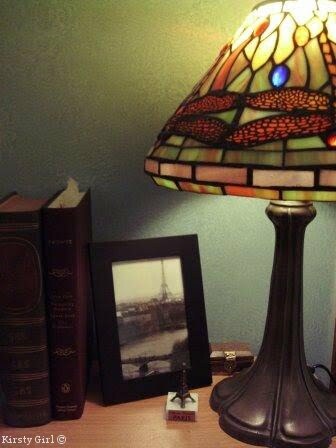 My photo, well no actually it's a postcard that I have framed that Andi sent me from Pari', my little Eiffel Tower there, very chic I know! A gorgeous little trinket box I was given when I was 13 by an old, dear friend and a couple of books I have on the go at the moment, Wuthering Heights and the Complete Plays of George Bernard Shaw. And as you ponder over the many glorious things I have in my possession, I will leave you with the wise, wise words of Mr. Bernard Shaw: "Think of the fierce energy concentrated in an acorn! You bury it in the ground, and it explodes into an oak! Bury a sheep, and nothing happens but decay." oooh a fresh new blog! welcome :) i like how you shared a cozy little nook from your home. looking forward to seeing more. i see you're on twitter, i'll add you in a minute. just wanted to thank you for dropping by my blog and leaving some love! It was fun to read this introduction and I love your bedside table. The lamp is wonderful (Gilmore Girls and Dragonflies are favorites of mine). Love your little Eiffel Tower, I have a little one my daughter brought me from her trip to France. Nice to meet you! Hi! Thanks for stopping by my blog! I love all the paintings...that is one talent I always wish I had! What a beautiful view you will one day have. I'll be sure to check in often! Good luck on putting together your soon to be home!